Welcome to Part 1 of the seventh and final season of Mad Men, which put AMC on the map before the network’s off-the-charts successes with Breaking Bad and The Walking Dead. For the still uninitiated, Mad Men remains a talkie, is presented in living color and originates from planet Earth. Thanks, you’ve been a great audience. We begin this way because reviewing any new season of Mad Men (re-starting Sunday, April 13th at 9 p.m. central) has more restrictions than a military base. They’re imposed annually by creator/executive producer Matthew Weiner, who set the standard in this field before others began imitating him to a lesser degree. We’ll abide by three of the five, because two of them are ridiculously excessive. No. 1, the New York-based, reconfigured Sterling Cooper & Partners ad agency already had established a West Coast presence by the end of last season. No. 2, keeping the year a secret would be valid if Mad Men suddenly hurtled a decade or even several years into the future. But that’s never been the case. So let’s just say that Episode 1 of Season 7 makes reference to the pilot for Bracken’s World and its impending filming as a potential series for NBC that fall. Any further research is up to you. 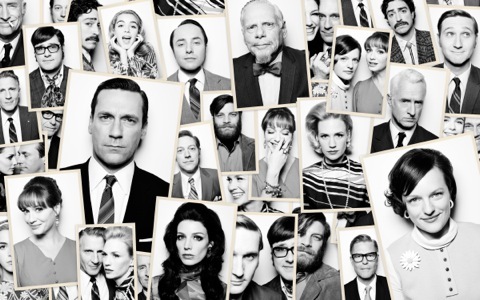 Although it’s about advertising, Mad Men has never been a particular winner among the advertising world’s most prized demographic group -- 18-to-49-year-olds. It’s entirely without the visceral violence and sudden deaths of Breaking Bad and The Walking Dead. Characters instead tend to die on the inside, doing unto themselves what those series accomplish with automatic weapons fire or sharp instruments. Fierce hangovers and chainsmoking are Mad Men’s principal blunt instruments. Don Draper (Jon Hamm), still dapper, remains the fulcrum. He’s uncommonly not seen immediately in Sunday’s Mad Men return, instead popping up around the eight-minute mark to the tune of “I’m A Man.” By all appearances he remains self-confident despite being drummed out of SC&P -- with severance pay -- near the close of Season 6. Fellow adman Pete Campbell (Vincent Kartheiser) and Don’s actress wife, Megan (Jessica Pare), are both newly established in Los Angeles (as was also dramatized last season). Don’s in town for a visit, and has an especially nifty exchange with Pete that epitomizes Weiner’s sharp writing of this episode. “You not only dress like a hippie, you talk like one,” Don retorts. Talk about your Hollywood squares. Back in NYC, Don’s former protege, Peggy Olson (Elisabeth Moss), remains with SC&P while still striving to have a voice. Meanwhile, Don’s old running mate, Roger Sterling (John Slattery), seems to be taking pleasures of the flesh to new extremes. The episode also includes an instructive chance meeting during Don’s “red eye,” an intriguing Bloody Mary-equipped brunch and continued machinations and manipulations at SC&P, where determined Joan Harris (Christina Hendricks) is still a partner in quest of a portfolio. Some of Mad Men’s core cast members are entirely unseen in this hour, and Weiner seemingly will be considerably challenged to keep at least one of them relevant this season. Mad Men is beautifully shot as always, with the dialogue flowing naturally and meaningfully over alcohol and, to an increasingly lesser degree, cigarettes. The pace hasn’t quickened. Nor does the storyline congeal. Instead, Sunday’s re-opener builds to a terrifically poignant finish accompanied by music that likewise cries out in pain. In this case, revealing that particular hit song indeed would be something of a spoiler. Which is never the intent in any trickily navigated Mad Men review. For all the world, though, it seems as if Weiner is telegraphing a re-meeting of the minds between lost souls with little more to lose. Dramatically speaking, that very likely could be a big win-win for both the series and its remaining loyal subjects.